„Life is bad, cruel and wrongous, and yet, my duty is to attain goodness, clemency and justice in it.” – said Hungarian writer Magda Szabó. We think that Conan Doyle and Sherlock Holmes would agree. Sir Arthur lived according to these standards and he gave the same characteristics to his most famous hero, the fantastic Sherlock Holmes. The detective follows the same standards on the pages of the canon. He gave goodness, clemency and justice with added hope to all readers. But as Voltaire told:”To tell others the truth or to suggest them to do useful things – these are the safest ways to make them persecuting us.” For this reason Sherlock became ridden. Many people misunderstand him: fans who know him lightly or media experts who think violence is very important. The latter often make him an unaffected sociopath, while some years ago several bloggers accused him being a racist. But our sincere hope is that the humiliation of a world famous writer, the creator of the most humane and philantropic sleuth is just a transition state. Not only because truth always exists and love is one of the greatest powers of the world, but because of the fact that Sherlock Holmes has true friends, Sherlockians who politely but effectively stand up for Doyle and for his wonderful character. We have to believe in ourselves and we have to believe in Sherlock Holmes. There will come a time when all what Conan’s hero represents returns into the brains and hearts – and we can do a lot to help this happen. Arthur’s soul was settled. He did not judge others by their financial status, clothes, looks or races, for him their thoughts and deeds were the most important. Ethic had firmed in him. This made him able to find real values, and he could appreciate the humane work of doctors like Joseph Bell or Oliver Wendell Holmes. He knew that though the world is cruel, thinking and behaviour are the most important factors that determine its state. He respected how responsibly, kindly and tirelessly Bell and Holmes did their job to make the life of their environment better. He strongly believed that he, as a human being is called to do the same. And when on a boring day he began to write the adventures of the Baker Street detective, whom he modelled after the aforementioned noble healers, he already possessed lots of wisdom. As he had few patients, it dawned on him that he will not make a living from healing, but he did not want to waste that enormous amount of knowledge what he collected while studying. He knew the world can be a better place even if he heals souls, not patients with wise and sincere words. He knew he can do a lot with a hero who shows people how they can make their way in life. As we all know, this hero is the British consulting detective, Sherlock Holmes. As an adult, Conan could forgive his father, and what is more, he did a wonderful thing which could only be done by a true artist. He organized an exhibition to display his father’s paintings, because he could appreciate him as an artist as well. A true artist loves not only his own artworks, but he can respect the work of others and if it is necessary, he stands for them. Unfortunately nowadays Doyle not always gets the respect he deserves. There are artists who think creative liberty allows them to put down the work of an author who died long ago, to disregard his original aim or to make fun of him. Some of them even reassure themselves that Doyle allowed William Gillette to make Holmes a married man in a theatre play. But the huge difference is that Gillette had the opportunity to meet Conan and personally ask his permission for the changes. The author kindly granted it. It became evident for Doyle that the American actor cordially loves the character, his aims are humane, so he not only granted his permission, but they became lifelong friends. It is no use to flatter ourselves that we can do everything with Holmes, because he is just a fictional character and Doyle is dead, and if he would be alive, he would excuse all. Conan undoubtedly was a very charitable man. But those who twist the characters and the message of the canon, or spread false information, may cause harm to those who still did not find their places in life. These people are in want of the original knowledge what lies in the canon. Those who humiliate the Sherlockian world, harm not only the Sherlockian traditions of the past, but in a way deteriorate the present and future of humanity – and this can be the proof that they are not artists in the true sense of the world, they are rather frustrated and unhappy. They make changes in a world which they do not fully understand and at the same time long for, because everybody needs a safer and more humane world. Such people may have chaos inside, and they may struggle with themselves day after day, what is very difficult. It is very important to understand that those who debunk or alter the original stories, maybe did not understand them or they flatter themselves that they know everything about Sherlock Holmes. But we must not feel indignant at them. They long for emotions and logical thinking, and hopefully one day the world will be a more understandable and enjoyable place for them when they learn to trust themselves, to collect information, to evaluate facts and to deduce – just like Sherlock Holmes. The world can only be our home when we understand it and dare to make changes in it with good intentions. The solution for many problems of the world can be communication combined with tolerance – this is what Doyle and Holmes used excellently. Our article tries to prove that Sherlock Holmes was not a racist. As an artwork always reflects the thoughts of its creator, first of all we have to examine whether Sir Arthur Conan Doyle was a racist or not. Can someone be a racist who wrote an article about Dorando Pietri, the Italian hero of the 1908 Olympic Games? Doyle respected his teachers and wanted to make people happier as a medical doctor. He protected a half Indian lawyer when he was in trouble, and paid the legal counsel of a Jewish man when he found out that there are contradictory charges against him. He did volunteer work (as a surgeon) in the Boer War. He nurtured a friendship with Harry Houdini, who also was Jewish and in addition, they had different opinion on spiritualism. He admired the gentleman style of dr. Patrick Wilson, so calling him wizen-hearted is stupid. Shortly before his death he still was able to tell his wife:”You are amazing.” He was very humane and had a good heart. Doyle born into a poor family. As a child, he prowled on the streets with other kids. At school, at the university and on the whaling ship Hope he met people from almost every classes. He learned to appreciate those who could excel thanks to their talents, not to luck or money. Though on the basis of his thoughts and emotions Conan was more like Watson than Holmes, the three of them had one thing in common: the sense of justice. The life of Conan Doyle proves that it is meaningless to talk about racism in connection with Sherlock Holmes. A few years ago an article circled around the internet entitled The 6 Most Secretly Racist Classic Children’s Books. Who were not familiar with the original adventures of the canon, misconstructed the sentences that were taken out of their original context and they believed the false picture these showed. The article mentions that Holmes talks about the Ku Klux Klan. The fact is true: in The Five Orange Pips he says a few things about the organization because Watson had never heard of it before. The detective obtains his information from a book and says nothing what should suggest that he sympathizes with the Klan. He often gives Watson run-downs during their investigations, and the same is the situation with the Ku Klux Klan. The article also talks about Steve Dixie, the black boxer, whom the sleuth does not ask to have a seat and shares some facts of the man with Watson (The Three Gables). But the authors of the article forget to point out that Dixie threatens and insults Holmes who disapproves his guest’s style of speech, and not the colour of his skin. Another important fact is missed out, namely that Sherlock is a detective, who has to be able to gauge and observe the looks of others very fast – it is necessary for giving a portrait. Holmes does this several times in the canon, so it cannot be called racism. We have to mention the Granada series, where creators genuinely modified the scene. Although Dixie threatens Holmes, the sleuth still tells him to sit down. Some may say that this proves the fact of racism, because the filmmakers changed the scene. But do not forget that they decided to change because they knew that viewers will translate the short scene otherwise than those who read the whole canon, because the latter knew Sherlock’s personality better. So they did not regard Doyle or Sherlock Holmes racist, the change of the scene was a part of the adaptation process. 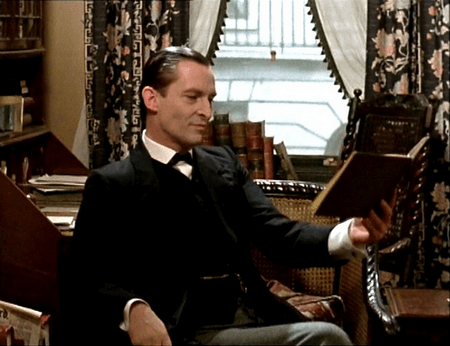 Jeremy Brett, the cast and the crew treasured the memory of the legendary British detective and his author with lots of love, and the Granada series is still one of the most faithful and most respectable versions of the canon, though it has its mistakes as well. As a curiosity we mention a Hungarian relation: while working with The Three Gables, Szilvia Ádám, who translated several Doyle novels before, altered the scene in the Hungarian version the same way as the Granada crew. So her opinion was that Holmes had no problem with Dixie’s skin colour. Let’s return to the canon for a little while. Sherlock says in The Reigate Squire:”(…) I make a point of never having any prejudices.”, and he always does so. There are some adventures in the canon where others say good things about black people and Holmes never reacts negatively to these. 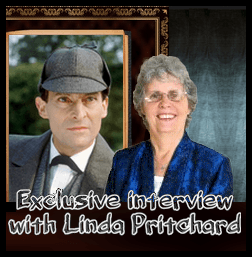 He had no prejudices: he could work together perfectly with the Baker Street Irregulars, and he appreciated the smart, true-hearted Irene Adler more than the characterless Bohemian king. Holmes works for the justice, and when he has to punish someone, he is always aware to the adequate level of the punishment. He is ready to forgive those who deserve it. As dr. Martin Luther King says:”Forgiveness is not an occasional act, it is a constant attitude.” Mahatma Gandhi thinks:”The weak can never forgive. Forgiveness is the attribute of the strong.” And the opinion of Tolstoy is:”Strong people are always good. Their power lies in their goodness.” Holmes gladly sacrifices his own life for the good cause, as he states it to Professor Moriarty in The Final Problem. He was interested in politics and in the future of the different nations as well, we can find several examples for this in the stories. Sir Arthur Conan Doyle and his hero were strong men with a heart of gold, who appreciated others by their deeds and aims.